Today is all about the exceptional elegance attached to the Hublot watches in the prestigious Big Bang collection. When it comes to wristwatches, the notion is always about fashion, and or precision. Nothing else. And when it’s about fashion, a timepiece is either simple-but-elegant or “flashy” and classy. That’s true. If you are looking for a simple watch model to fit in your prospective ostentatious profile, surely you will have to work like a Trojan. Classic. Sophisticated. And Flamboyant. Hublot watches have been exclusively designed for those with a special liking of timepieces that possess an ornate design, alongside exquisite and timely precision. Although there are over three dozens of the ornamental watch models in the Hublot Big Bang collection. Following is a list of the top-best of these Hublot watches whose splendor has been topped with gold for an ultra-luxurious stylishness. Are you a lover of Reggaeton? Can’t go for a day without quenching your bones with a Nicky Jam’s latest hit? Well, let’s just say it’s time for a more dazzling moment. Time to connect with your favorite artist uniquely and in a more especial manner using the 414.OX.4010.LR.4096.NJA18 Meca-10 “Nicky Jam” King Goldwatch. Colorful and ultimately reliable, this Hublot Big Bang model matches your humongous liking perfectly. Following its 45mm case which is made of highly-polished 18K King Gold, then covered with a set of orange, yellow and green baguette sapphires. For the elegance of the inner casing as well, the skeletonized gold dial of the 414.OX.4010.LR.4096.NJA18 Hublot gold watch is set with a ring of 133 multicolored sapphires. And the time hands coated with orange luminescent for optimum readability in the darkness. Having doubts with the precision of this Hublot Big Bang? Why should you! Its 24-jewel caliber HUB1201 manually-wound movement can multitask time precision, tourbillon features, and a minimum of 10-day power serve! If you have ever wished for an especial glamor that is exclusively yours, now is the moment with the 465.OX.1190.VR.1299.MEX18 Calavera Catrina King Gold watch. With its limited edition, you not only shine your fashion with exclusivity, but also become 1 of the 50 owners of Calavera Catrina Gold model! As one of the Hublot watches comprised of cutting edge innovativeness, this Hublot gold watch is a blend of the Mexican culture, alongside Hublot’s incredible craftsmanship. For a vibrant grandeur on its exterior King Gold case, the bezel of this Hublot Big Bang watch features brilliant multicolor sapphires. While the inner casing has a lacquered dial with a rainbow “Mexican skull” imprint. For optimum precision, 465.OX.1190.VR.1299.MEX18 Calavera Catrina King Gold watch runs with caliber HUB1710 Self-winding Movement that can reserve power for up to 50 hours. Whilst ticking at 8 beats every second. If you’re an underwater enthusiast, you don’t have to leave your Hublot Big Bang watch behind during your dive adventures. Clasp the multicolor-imprinted leather strap finely, then enjoy your underwater moment without any worry (though to a maximum depth of 100m). Although some will group it under Hublot gold watches for the women, I believe every man who comes across it definitely pines to own it. Its matte white dial is not only classic, but also a perfect match for the purpled Amethyst-set bezel and the brushed 18K Gold 5N case. Following its chronograph nature, the 341.PV.2010.LR.1905 Gold Purple Amethysts watch features distinctive Arabic minute and hour indicators, along with two pushbuttons for setting its chronograph sub-dials. To enhance its superlative elegance wholly, Hublot Company has installed this gold watch with caliber HUB4300 that is impeccably guaranteed to reserve power for 42 hours minimum. While still offering you with multiple functions, including chronograph, hours & minutes, and even date between the 4 and 5 o’clock indicator. Feeling attached to your old chronograph, but finding it hard to replace it with a modern ornate model? Rise and smile, my dear! 411.WX.1179.LR.0919 Hublot Big Bang watch is all you need. Classic. Reliable. And a darling of sophistication. This timepiece is a blend of peerless creativeness and technicalities that have been borrowed from other iconic Hublot Watches. As a luxury wristwatch, the timepiece features a highly-polished white gold case, set with 176 ornamental Paraiba Tourmalines and a skeletonized matte black dial. To provide you with a uniform bluish profile, 411.WX.1179.LR.0919 Unico White Gold Paraiba watch has its hands, hour indicators, and the Hublot trademark stamp in blue color. This applies on the shiny Turquoise Alligator Straps as well. For it to present you with accurate chronograph functions, the 45mm Hublot Big Bang model runs with the self-winding caliber HUB1242 which supports even flyback features. Well, since not everyone is attached to the “flashy” attributes, ornamental Hublot Watches for your “simple-but-elegant” profile are available at Big Bang collection as well. With one being the 465.OX.7180.LR.1204 One Click King Gold Blue Diamonds watch. Following its 39mm 18K King Gold case, this Hublot Big Bang model is perfect for anyone, both male and female, who wants to play it simple and less showy. For its ornamental embellishment, the timepiece’s gold bezel is fixed to the case with 6 H-shaped screws made of titanium, then embedded with 42 brilliantly-shaped diamonds. For optimum readability in the dark backgrounds, the blue sunray dial of the 465.OX.7180.LR.1204 features luminescent hour indicators and hands. Of which have been made with 18k King Gold as well. Talking of precision, this timepiece has an automatic HUB1710 movement that is superlatively reliable for the accuracy of time, as well as with the date function at 3 o’clock. 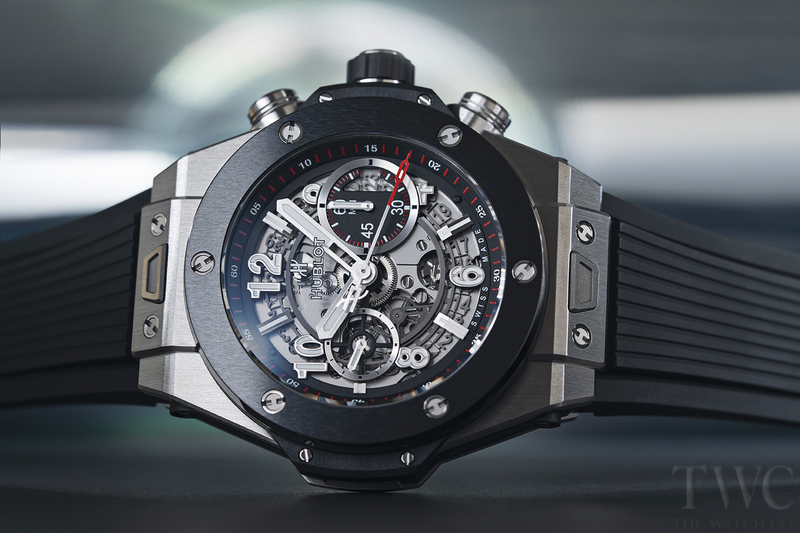 At Hublot, designing a watch is not something they do for a day or even two. The craftsmanship the Swiss brand uses involves creativity that bears inspiration from extensive research and staunch dedication. Since its aim is creating unique Hublot watches that are superlatively precise and distinctive in glamour. If it’s Hublot gold watches, for instance, in spite of the added ornamental gems, the Hublot watches using the King Gold (reprocessed 18K gold) will always remain notably unique. Since their color is much redder than the usual 18K gold 5N.